Make a donation online to RACDV now and make our day! Donate online now via BT’s mydonate pages and every penny of your donation goes straight to RACDV – BT do not take any commission or charges. Please note: Donors’ card issuers may charge a fee. Your standing order helps us to budget and plan ahead. Even just £5 a month is an enormous boost to us. Simply download the standing order form from here, complete it and post it to RACDV, Cottage Day Centre, 100 Brands Hatch Park, Scratchers Lane, Fawkham, Kent, DA3 8PU. You will soon be able to donate to RACDV by mobile text – watch this space for details. 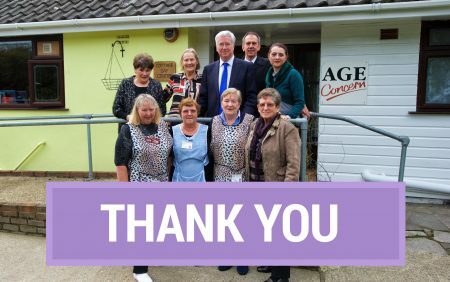 You can write a cheque out to “Rural Age Concern Darent Valley” for your chosen amount and post it to RACDV, Cottage Day Centre, 100 Brands Hatch Park, Scratchers Lane, Fawkham, Kent, DA3 8PU. If you want to organise a fundraising event let us know by emailing us at ceo@racdv.org.uk or telephoning 01322 666448. One of the easiest ways to get sponsorship is by setting up a fundraising page to benefit Rural Age Concern Darent Valley on BT mydonate. You can do this by clicking the box below. If you have stuff you no longer want we would welcome them as a donation for recycling and resale in our charity shop in Swanley. We accept most articles in a good condition including clean clothes, pairs of shoes and boots, ornaments, CDs, DVDs, vinyl records, books, children’s toys, soft furnishings like curtains, cushions, blankets, kitchenware including sets of cutlery (no carving knives etc) sets of crockery, cups and plates and glasses in good condition, small items of furniture e.g. coffee tables, small bookcases etc.